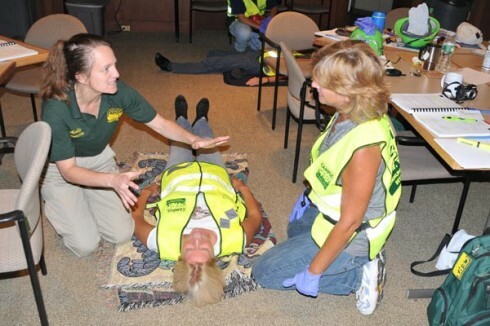 Holly Jacobs from the Manchester Community Emergency Response Team (CERT) left, teaches Joyce Topshe, associate vice president for facilities, at right, how to properly give a “head-to-toe assessment” on an accident victim. Stacy Baldwin, construction project coordinator, plays the role of an injured person. An injured woman lays limp on the floor of Woodhead Lounge. She’s conscious, but immobile. Spalding, who was giving a “head-to-toe assessment” on acting accident victim Christine Cruz, safety coordinator, was training for Wesleyan’s Community Emergency Response Team (CERT) program. In the event of a real disaster, crisis or common emergency, Spalding will be prepared to assist first responders, provide immediate assistance to victims, and organize spontaneous volunteers at a disaster site. 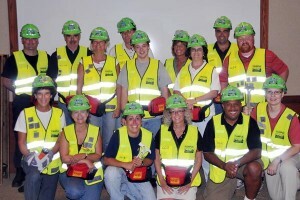 Campus CERT members can also help with non-emergency projects that help improve the safety of the Wesleyan community. Thirteen Wesleyan staff members and four participants from Western Connecticut University and Eastern Connecticut University completed the three-day CERT Training Aug. 18-20. Four CERT instructors led participants through three days, or 20 hours, worth of lessons. Using the training learned in the classroom and during exercises, Campus CERT members also are encouraged to support emergency response agencies by taking a more active role in emergency preparedness projects in their community. Thirteen Wesleyan staff members are certified as Campus Community Emergency Response Team (CERT) members. The program is supported by the Department of Emergency Management and Homeland Security. On Aug. 19, the class discussed several disaster medical operations. Participants established a medical treatment area, performed basic first aid, discussed sprains, nasal bleeding, hypothermia, splint bones and treat impaled objects. “So if the person has a giant chunk of glass stuck in his arm, you just leave it in?” asks Joyce Topshe, associate vice president for facilities. Trainer Gerald McMillen from Middletown Emergency Management explained that the impaled object may be blocking an artery, and if she removed the glass, the arm may start pumping blood. “It’s best to wrap around the glass and leave that for the paramedics to take care of,” Jacobs says. The program, which is supported by a $3,025 grant from the Department of Emergency Management and Homeland Security, included six sessions: Disaster Preparedness, Disaster Fire Suppression, Disaster Medical Operations I and II, Light Search and Rescue Operations, Disaster Psychology and Team Organization and Disaster Simulation. The Community Emergency Response Team concept was developed and implemented by the Los Angeles City Fire Department (LAFD) in 1985. Since 1993 when this training was made available nationally by FEMA, communities in 28 States and Puerto Rico have conducted CERT training. Wesleyan’s cohort joins 37 other CERT programs within the state of Connecticut. The Wesleyan CERT team is currently part of the Middletown CERT, but in six mon Nelligan and Joyce Walter, director of the University Health Center, took a CERT “train the trainer” course in March. The Wesleyan Campus CERT members include Nelligan; Walter; Sillasen; Baldwin; Topshe; Spalding; Cruz; Josh Hamilton, Usdan University Center evening manager; Michelle Myers-Brown, Usdan University Center director; Cheryl-Ann Hagner, director of university events and scheduling; Ricky Howard, project manager in Physical-Plant – Facilities; Cliff Ashton, director of Physical Plant; and Don Albert, Chemistry Department facilities manager. Nelligan hopes to recruit 100 Campus CERT members. He will hold additional training sessions in the future. Anyone interested in becoming a Campus CERT member should e-mail Nelligan at wnelligan@wesleyan.edu.